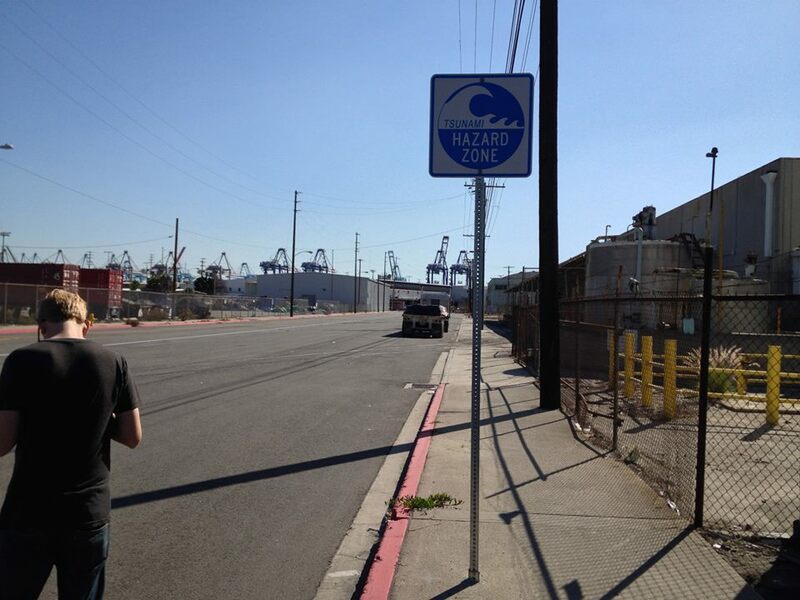 The other day I explored Terminal Island with Matt. 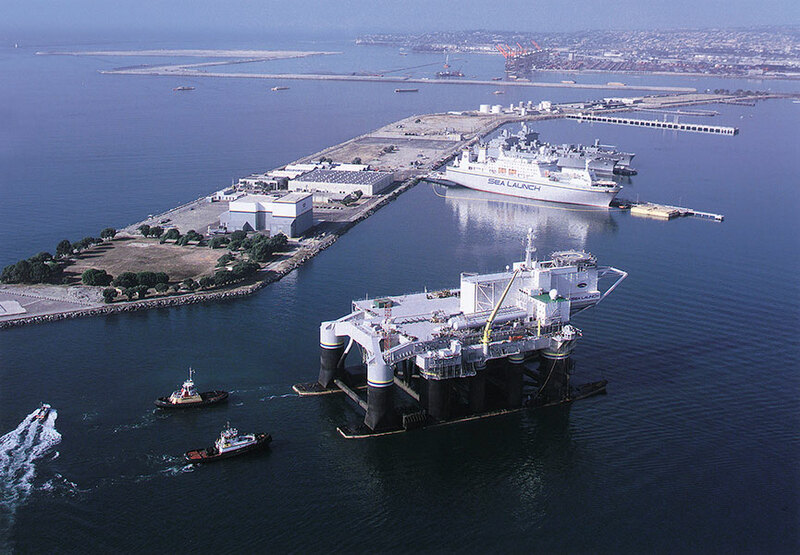 Terminal Island is a fairly large (11.55 km2) island that is administered by the cities of Long Beach and Los Angeles. Although most of its area is dominated by container terminals (APL Container Terminal, APM Terminals Pier 400, Pier T Container Terminal, Seaside Container Terminal, and Yusen Container Terminal), there are many abandoned, crumbling and rusting industrial areas as well as interesting historical sites. Completely off the radar of most Angelenos yet one of the most important facilities in the region, it’s a fascinating place to explore. Terminal Island is a largely-artificial island located in Los Angeles County and divided between the Los Angeles neighborhood of San Pedro and the city of Long Beach. It’s home to both the Port of Los Angeles and Port of Long Beach, which together form the largest port complex outside of East Asia. Perhaps in part because it has bears no resemblance to the stereotypes of coastal Southern California, the industrial Harbor region has always held an attraction. In place of rollerbladers, surfers, and drum circles there are wharf rats, fishermen, and truckers. Instead of palm trees and beaches there are giant cranes, piers, and plenty of industrial ruins. There are many historic sites of interest on the island, from appearances more often spared from destruction by neglect rather than preservation efforts. 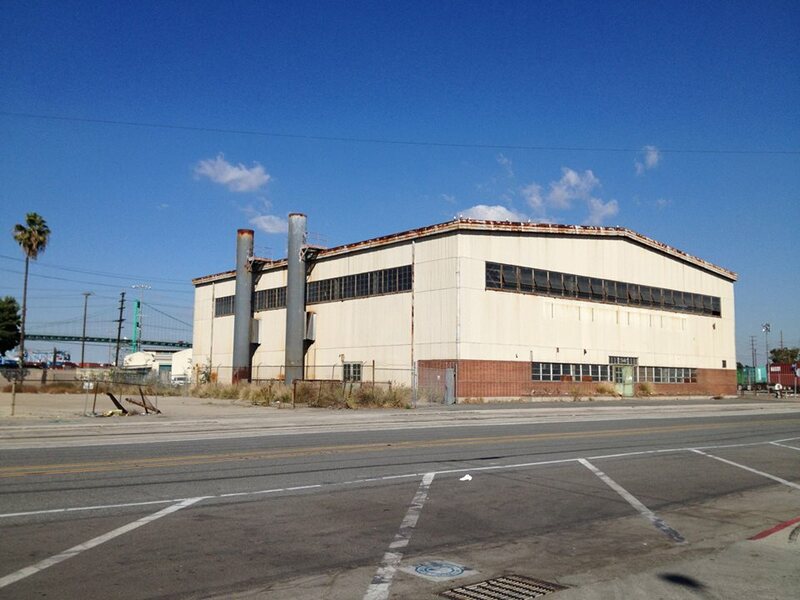 Redevelopment on Terminal Island rarely endorses adaptive reuse and in 2011, The Port’s proposed Terminal Island Land Use Plan called for the razing of several old structures. That’s not to suggest that the island is completely off the radar of preservationists. The National Trust for Historic Preservation included Terminal Island in their list of “America’s 11 Most Endangered Historic Places” in 2012. Other pressing issues effecting the island and region beyond include pollution and labor disputes. Still, there’s more than just pollution and discontent in the air, there’s the romance of the sea. One of my favorite websites is Marine Traffic, on which you can watch the ships as they head (in most cases) back and forth between far off ports in Hong Kong, Japan, Korea, Taiwan, and Vietnam. Native Americans have lived along the Southern California coast for over roughly 13,000 years. The area’s aborigines were most likely the ancestors of the Chumash. Much later, the Tongva arrived from the desert to the east. They established several villages in the area around Terminal Island including Ahwaanga, Povuu’nga, and Tevaaxa’anga. Juan Rodriguez Cabrillo arrived at what he called the “Bahia de los Fumos y Fuegos” in 1542 and claimed the country for the Spanish Empire although Spain didn’t establish a presence in the area until the 18th century. In 1784, Spain granted the 300 km2 Rancho San Pedro to a former soldier, Juan José Domínguez. The rancho included a shallow mudflat which the Spanish called Isla Raza de Buena Gente that later was transformed into Terminal Island. Mexico gained independence from Spain in 1821. The San Pedro Bay remained a shallow port and boats either ferried goods and passengers ashore or were intentionally beached. After the US defeated Mexico in the Mexican-American War, Isla Raza de Buena Gente was renamed by the Americans “Rattlesnake Island,” for the reptiles swept downstream and deposited on what was little more than barrier of sediment in the estuary of the Los Angeles River and Dominguez Slough but within a couple of decades the landscape was transformed considerably. In 1858 Phineas Banning founded the town of Wilmington. Banning operated stagecoach lines to Salt Lake City and Yuma and in 1868 added a railroad line from San Pedro to Los Angeles — the first in the region. The first private ferry was launched in 1870. In 1871 Banning dredged a three meter deep channel to Wilmington which allowed the port to increase its shipping traffic that year to about 45,000 metric tons. Banning died in 1885 and his sons continued efforts to promote the port whose traffic continued to increase dramatically. In 1891, the Terminal Land Company purchased the island and a railway was built on to its east side by the Los Angeles Terminal Railroad Company. That year the new owners renamed Rattlesnake Island “Terminal Island” — a somewhat foreboding name, but certainly less unappealing than its former appellation. Meanwhile, the Southern Pacific Railroad’s Collis P. Huntington was promoting nearby Santa Monica Bay as a deep harbor and built the Long Wharf there in 1893. In 1897, thanks largely to the efforts of Los Angeles Times publisher Harrison Gray Otis, San Pedro Bay got the federal endorsement and breakwater construction began in 1899. 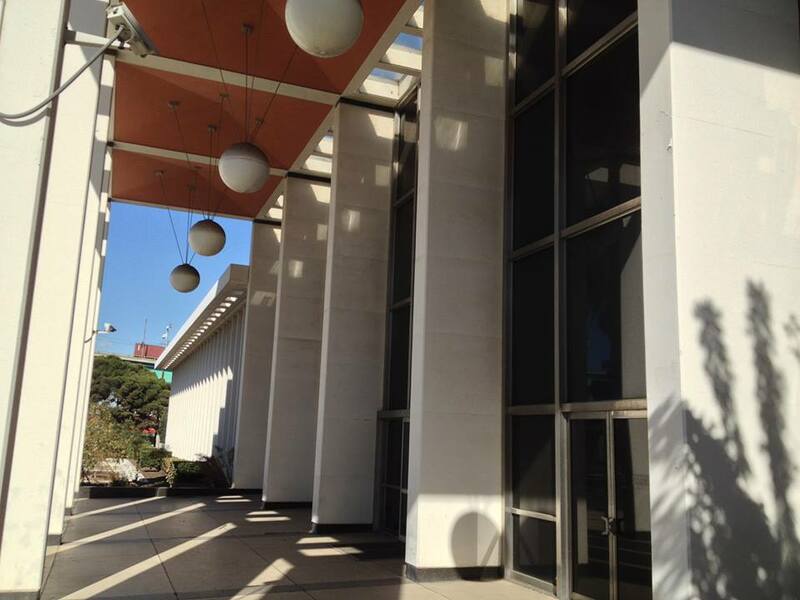 The Los Angeles Board of Harbor Commissioners was founded in 1907. The area, including the towns of San Pedro and Wilmington, were annexed by Los Angeles in 1909. Toward the end of the 19th century, an upper class resort was established on the southern short (along present day Seaside Avenue between Ferry Street and Navy Way) and named Brighton Beach. The playground of the wealthy included an hotel, a restaurant, a bar, a boardwalk, and roughly 200 cottages. By 1901, Brighton Beach was a popular with yachtsmen, who established the South Coast Yacht Club (Southern California’s first recreational boating group) and held their first official race (to Point Fermin) in 1902. Brighton Beach came to a fairly abrupt end when a major dredging project shrank the beaches and allowed for the construction of fish canneries which primarily employed Filipinos, Japanese, and Mexicans. No longer attractive to the upper class, many rented out their houses to the newly arrived working class. The Japanese in particular made their mark on the island, establishing a village that they called Furusato and speaking in a dialect that came to be referred to as “kii-shu ben” (most of them originally came from the Kii district in Wakayama). 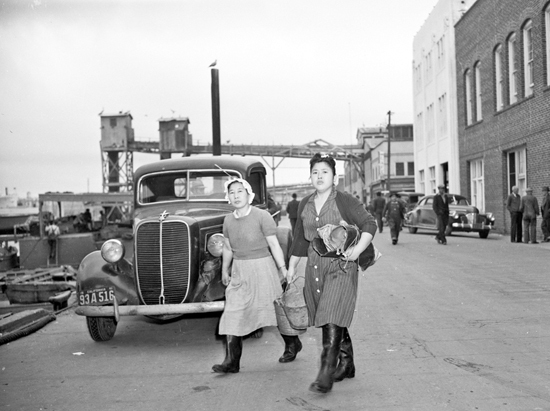 A population of about 3,500 Japanese-Americans called the community home until 1942, when all were sent to concentration camps — most often Manzanar — where they were interred alongside about 110,000 Americans of Japanese ancestry. Furusato was redeveloped as Roosevelt Base, named after the president who’d passed Executive Order 9066 which allowed for the villagers’ internment. A row of modest, commercial buildings along the 700 block of Tuna Street still stand. They formerly housed the Nanka Company Dry Goods Store (1918, remodeled in the 1940s) and the A. Nakamura Company Grocery Store (1923), run by Akimatsu Nakamura. 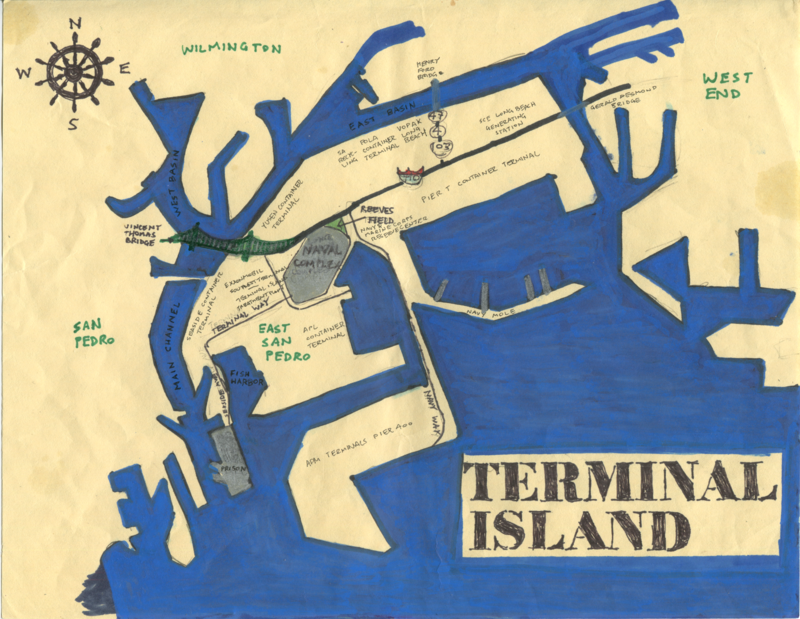 In 1971, some of them formed the Terminal Islanders Club and in 2002 the Terminal Island Japanese Memorial was dedicated in recognition of their shameful mistreatment. There are still a few physical reminders of their presence. 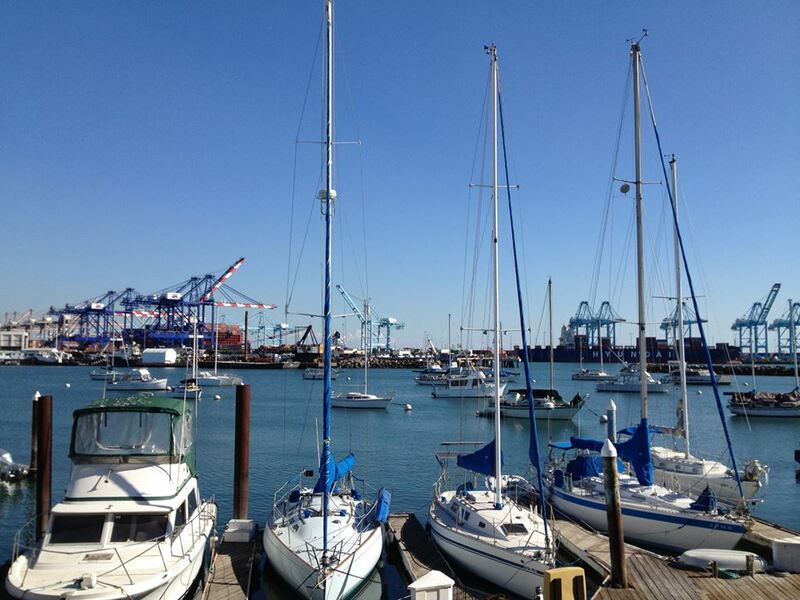 The Port of Los Angeles, also called Los Angeles Harbor Department, opened in 1907 and occupies 3,000 hectares of land. It is the busiest port in the US. Plant No. 1 was built by Southern California Edison Company in 1909 to provide reserve capacity and emergency power for the entire Edison system and to allow older steam plants to shut down. 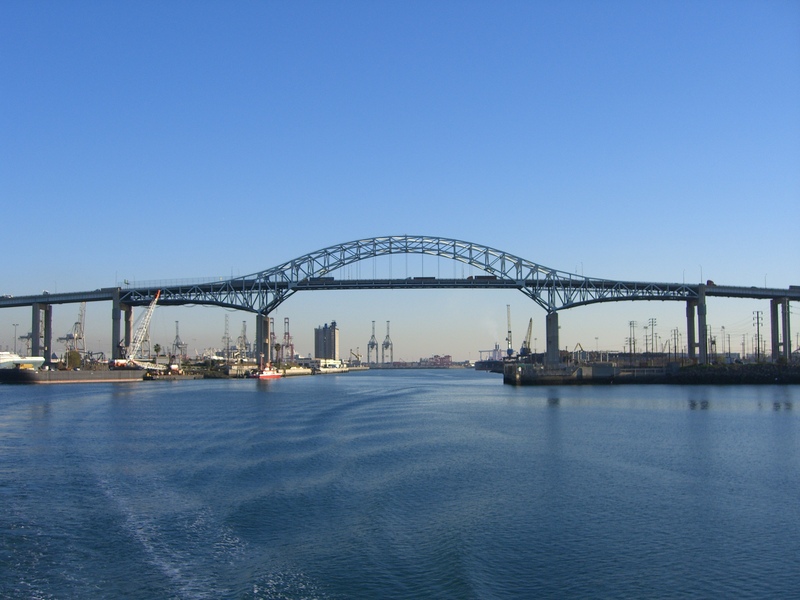 The Port of Long Beach, also known as Long Beach’s Harbor Department, opened in 1911 and is the second busiest port in the US. 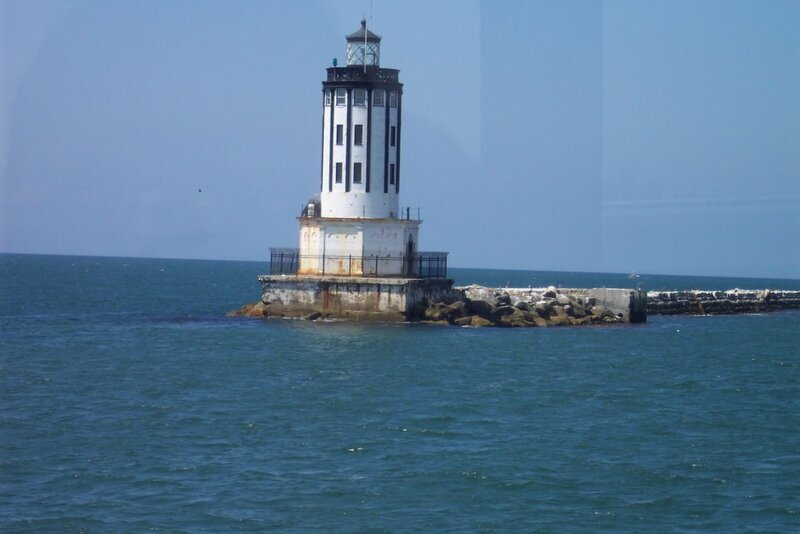 A lighthouse called Los Angeles Harbor Light, also known as Angels Gate Light, was first lit in 1913. Inaccessible to the public (it’s been fully automated since 1971), it can best be seen from Cabrillo Beach. 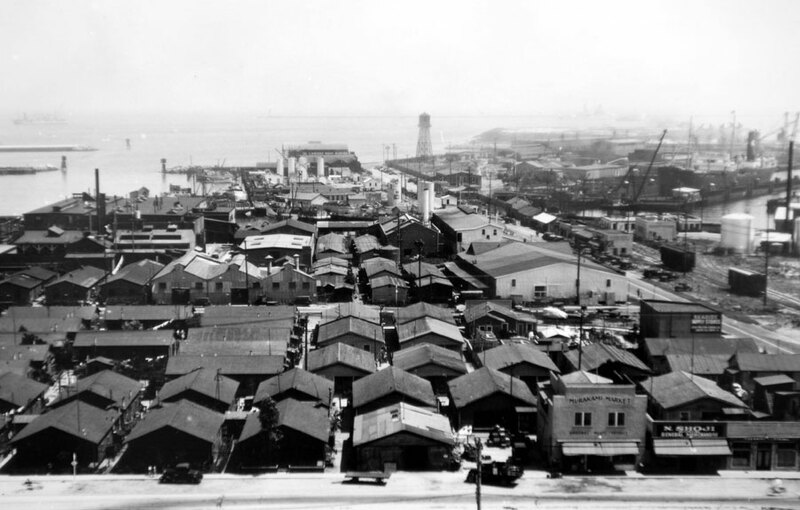 In 1921, oil was discovered at the Long Beach Oil Field on Signal Hill. 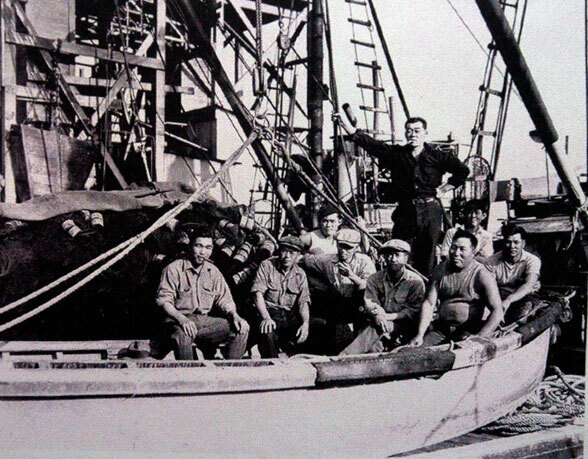 In 1932, the fourth-largest oil field in the US, Wilmington Oil Field, was discovered. The influx of oil and need to transport it to foreign markets let to another big expansion of the port. California Tunny Company (1912-1914 and Van Camp Seafood Company from 1914-1997) operated out of the Chicken of the Sea Cannery, built in 1943. It was the last operating cannery on the island. The Star-Kist Company was founded by Yugoslavian immigrant Martin J. Bogdanovich on Terminal Island in 1918 as the French Sardine Company. In 1952, a new Main Plant designed by John K. Minasian was built in 1952. It was the largest cannery in the world. The Pan-Pacific Fisheries Cannery was built in 1946. 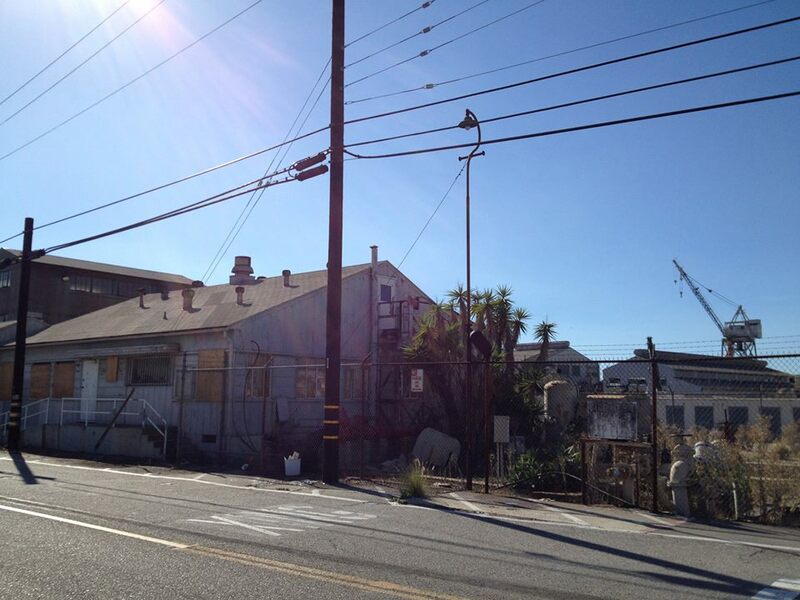 The property, bounded by Sardine, Barracuda, Bass, and Ways Streets includes two buildings — a processing plant and a warehouse. Southwestern Shipbuilding and Dry Dock Company was established in 1917 and was engaged in ship constructions and repair until 1981. In 1922, their shipyard at Berth 240Z was acquired by Bethlehem Shipbuilding Corporation, Ltd who reoriented the shipbuilding facilities into repair ones. 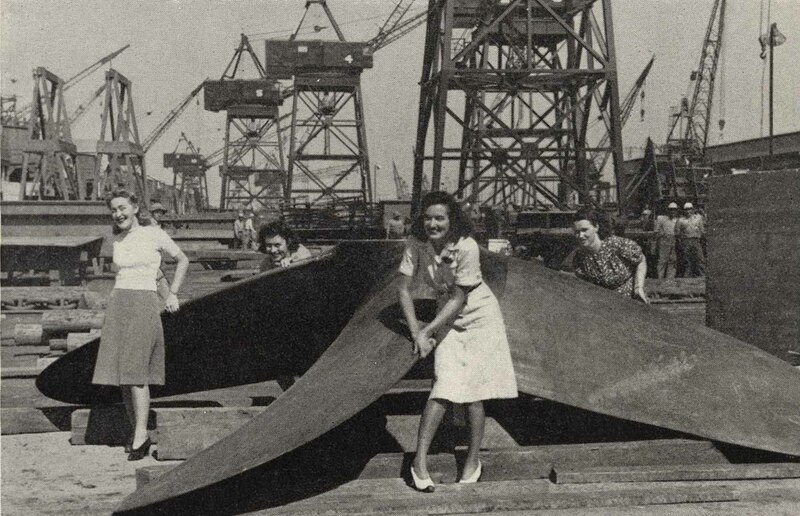 During World War II it was the nation’s second-largest steel producer and employed over 90,000 workers. 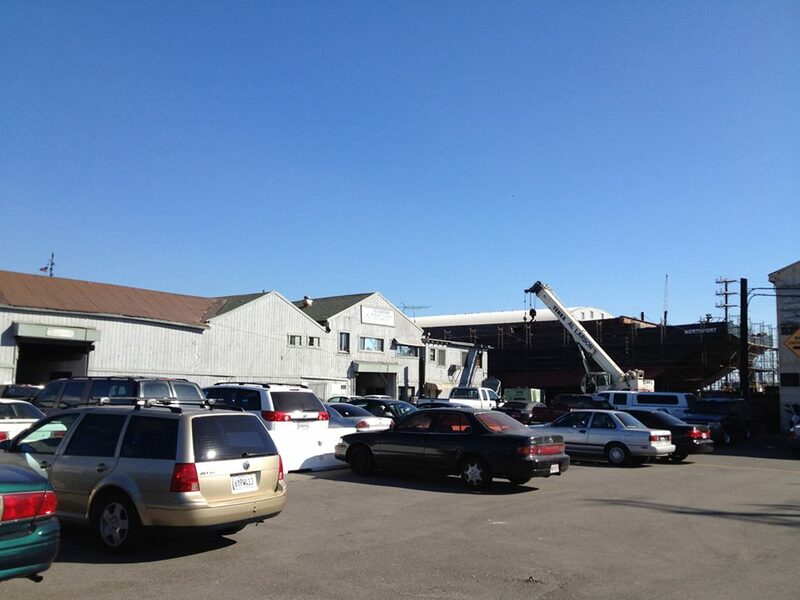 In 1981, Bethlehem left and Southwest Marine, Inc. purchased the yard and operated it as a ship repair facility until 2005. Across Seaside Avenue are the Al Larson Boat Shop and Al Larson Marina. In 1903, Swedish immigrant Al Larson established the much smaller Al Larson Boat Shop in Wilmington. 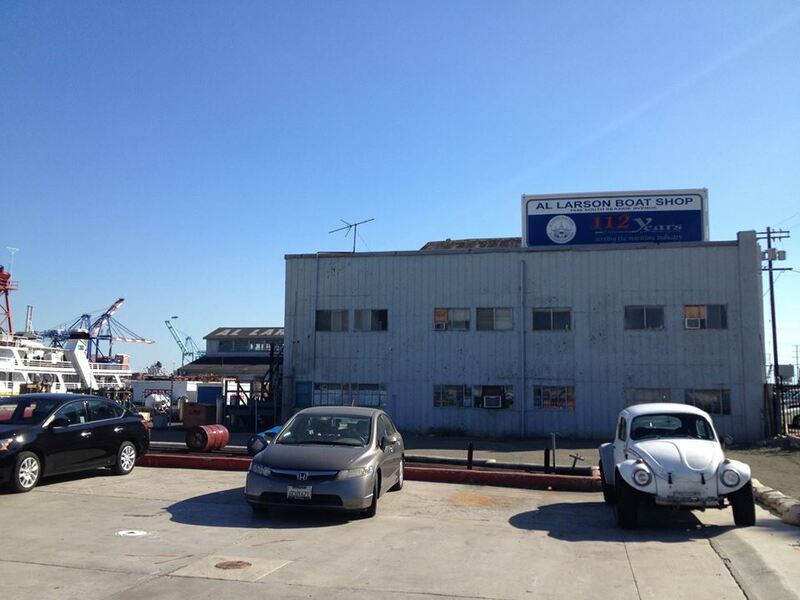 First engaged in making and repairing small fishing boats, Larson moved to Terminal Island in 1924 and during World War II built YMS-1 Class Auxiliary motor minesweepers for the US Navy. The shop is still there (added to in 1941) and joined by a machine shop built in 1938. 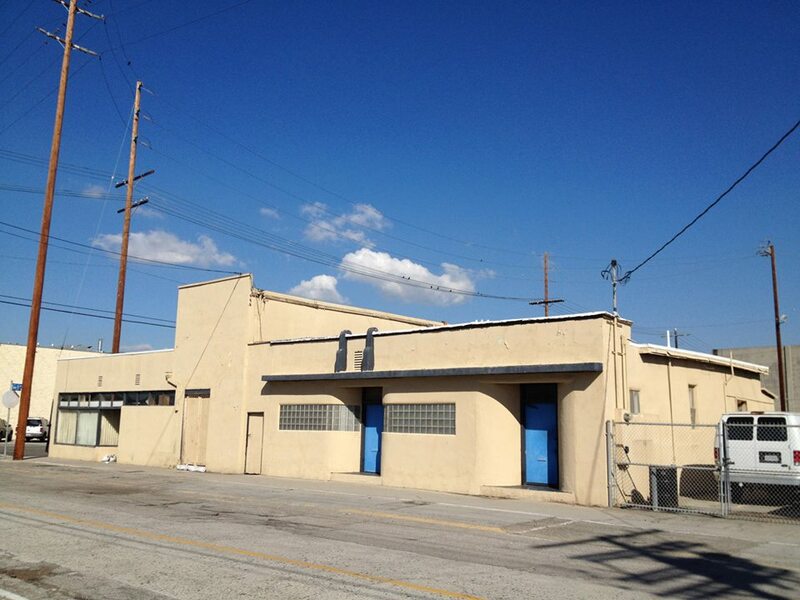 The small, brick Sewage Pump Station #669, also known as Harris Place Sewage Pumping Plant, was built in 1923 and is the second-oldest remaining pumping station in Los Angeles. It continues to function to this day! 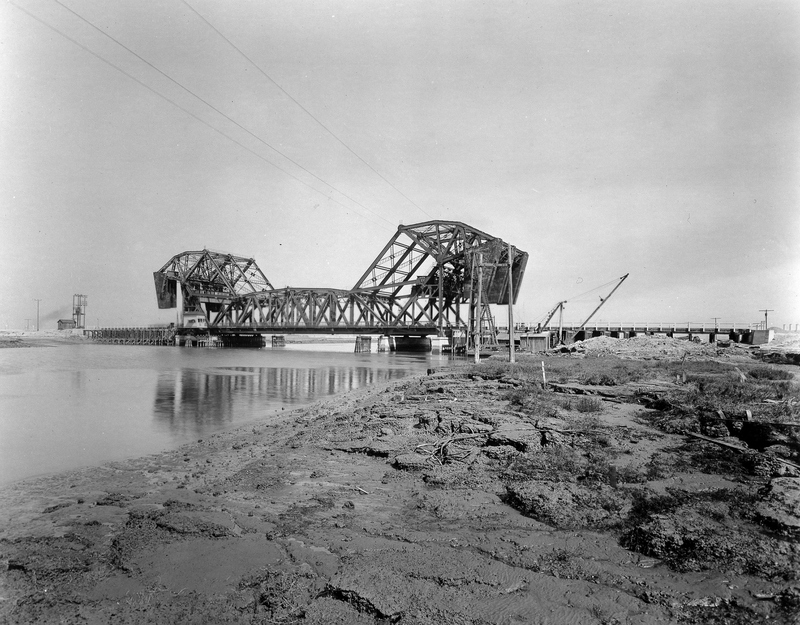 The Badger Avenue Bridge, later renamed the Henry Ford Bridge, was built in 1924. 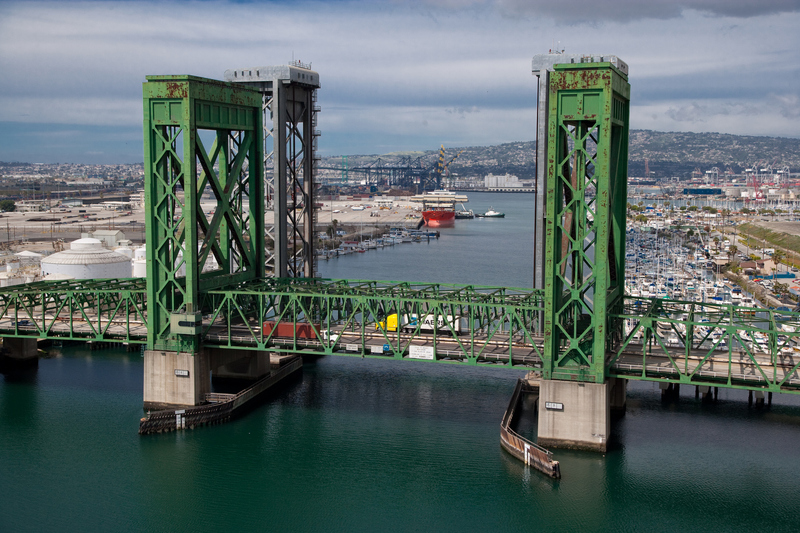 The trunnion bascule bridge was designed by Joseph B. Strauss, chief engineer for the Golden Gate Bridge. It was closed to automobile traffic in 1978. The original bridge was demolished and replaced in 1996. 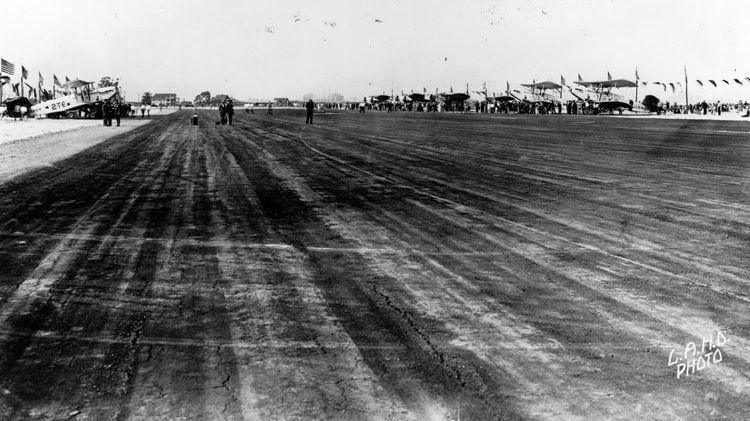 A small airfield called Allen Field was established on Terminal Island in 1927. The Naval Reserve, which had established a training center at the field, took control over the field and redesignated it Naval Air Base San Pedro. In 1941 the Long Beach Naval Station was established next to the airfield. In 1942 the Naval Reserve Traning Facility was transfered and the field’s status was downgraded to a Naval Air Station (NAS Terminal Island). Also known as Reeves Field, it operated as an auxiliary airfield until 1997, the same year the the Long Beach Naval Shipyard was decommissioned. 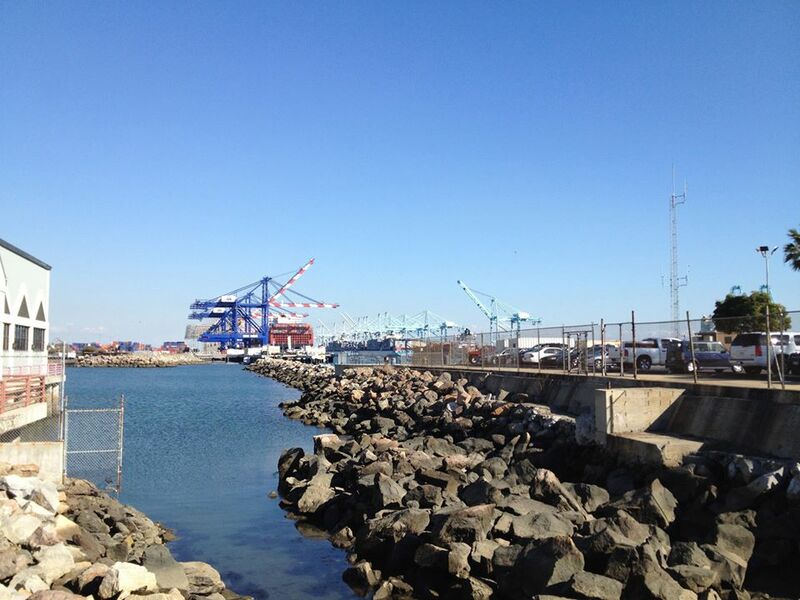 In 2003 the old shipyard became Pier T Container Terminal. 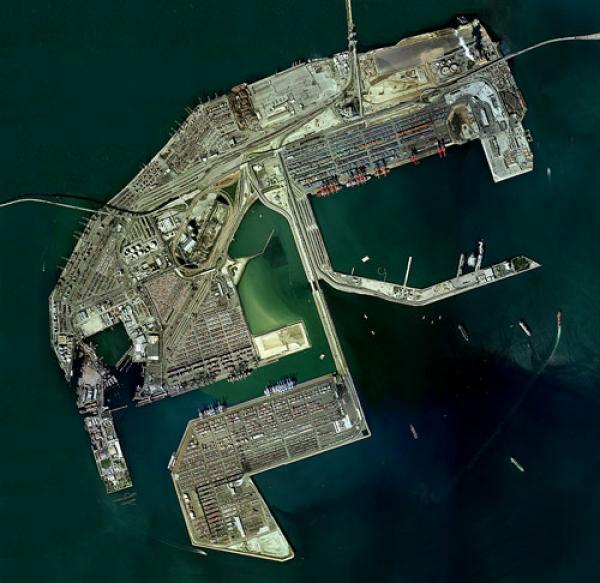 The “Navy Mole,” (an constructed peninsula), is now home of the 7 hectare Sea Launch Home Port Facilities. Docked there are the Sea Launch Commander (Sea Launch’s command ship), the Sea Launch Ocean Odyssey Platform (a mobile spacecraft launch platform), and two Navy ships — the SS Cape Isabel and SS Cape Inscription. Fireboat House 1, also known as Fire Station No. 111, was built in 1927. 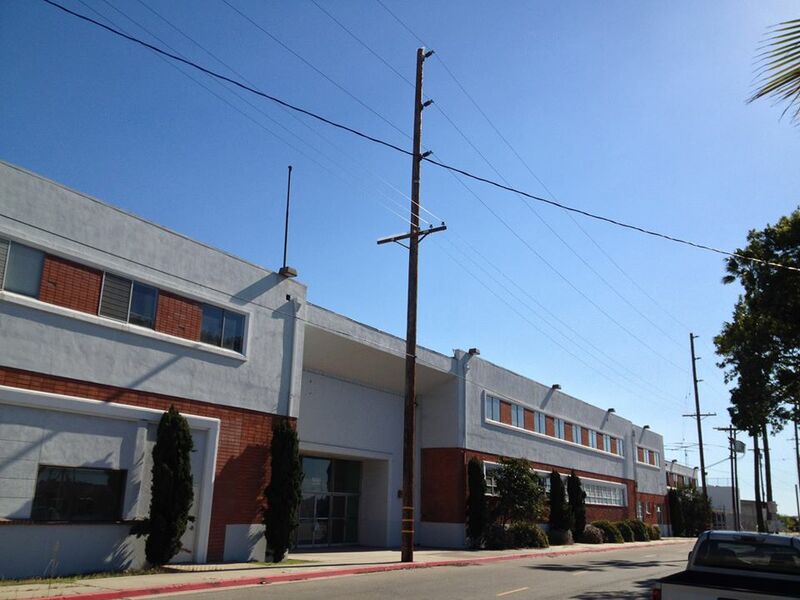 It was one of two firehouses built in the 1920s to serve the former Terminal Island community along the shores of Fish Harbor, known as East San Pedro. Fire Station No. 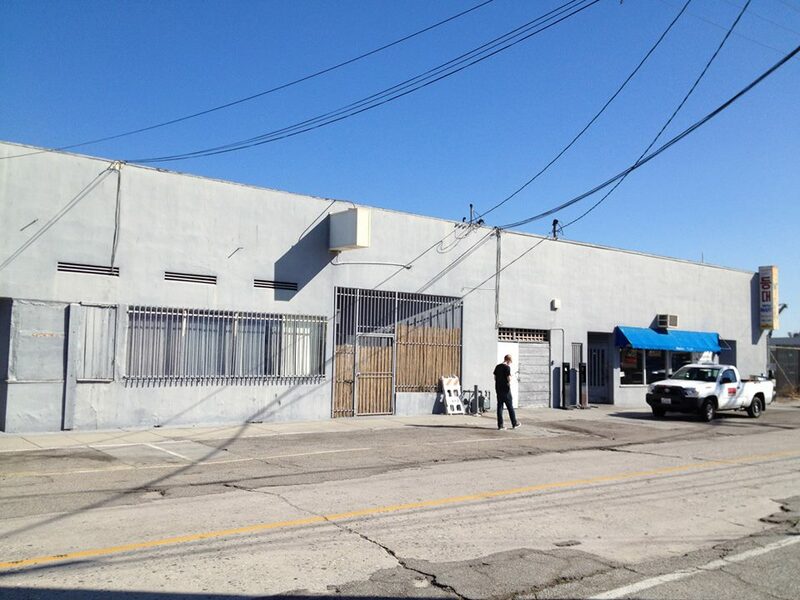 112, despite being designated Los Angeles Historic-Cultural Monument #154, was demolished in 1986. Fire Station No. 111 served as a fireboat house until the 1990s when it was transferred to the Port of Los Angeles Police Dive Team. There were many legends about how a 17-meter tall rock islet in the harbor called Deadman’s Island, also known as Isla del Muerto, got its name. Most storied involved sailors and smugglers who were supposedly buried there or more improbably, died there after being stranded. One of the dead was said to be the last surviving Nicoleño, a man named Black Hawk. However, during the Mexican-American War, the remains of at least six Americans killed in the Battle of Dominguez Rancho were interred on the island. The island was apparently popular as a body-dumping site because the waters of the channel discouraged hungry scavengers but as the channel was deepened the water began to carve away at the island exposing coffins and skeletons. 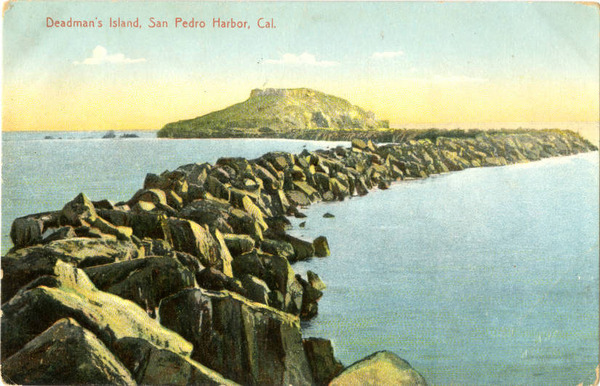 In 1928, the 17-meter tall rock islet in the main channel until it was dynamited (presumably after the remaining bodies were relocated) and the rubble was used to expand Terminal Island’s southern tip. Eventually the South Coast Yacht Club became the Los Angeles Yacht Club. In 1937 they built a clubhouse on the east side of Fish Harbor. The club remained there until 1993, when they moved to their current location along the West Channel’s Cabrillo Marina on the mainland. After the yachts sailed away, the clubhouse was taken over by the then-newly-formed American Marine Corporation. We weren’t able to see it as we tried to walk down Barracuda Street but found our way blocked by gates. The Terminal Island Federal Correctional Institution opened in 1938. The first prisoners (610 men and 40 women) were processed and admitted on 1 June, 1938. In 1942, the US Navy assumed control of the prison and used it as a barracks for court-martialed prisoners. In 1950, California reassumed control and used it as a medical institution. In 1955 it was converted back into a prison which it remains today. In the 1980s it was the location of a huge corruption scandal that resulted in the indictment of six Terminal Island federal employees (including the prison’s chief investigator) for bribery, cover-ups, and drug dealing, among other crimes. It was also in the 1980s that the prison’s processing facility became a detention center for immigrants. Between 2004 and 2007 more than 70 immigrants died there whilst awaiting deportation or sentencing. After the high profile death of Victoria Arellano, who died from neglect, the surviving immigrants were relocated to Texas. Although I hadn’t attempted to take any photos, a zealous guard greeted me to warn me not to attempt to because “it’s a federal building” which, if it was meant to be a legal explanation, only confused me. Luckily, there are plenty of pictures of this (and other federal buildings) online, in libraries, and other personal and public collections. The municipal ferry first launched in 1941 and remained in operation until 1963, when it was replaced by the Vincent Thomas Bridge. The old ferry was converted into a fishing barge until it burned up in 1974. 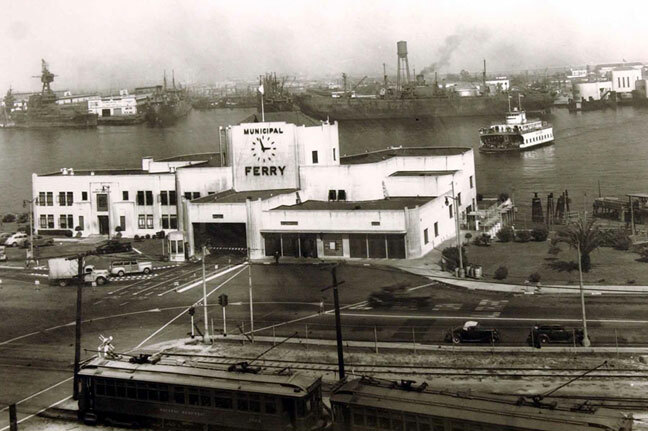 The ferry’s mainland boat house became the Los Angeles Maritime Museum in 1980 and the exhibits therein cover, among other things, the history of Terminal Island. 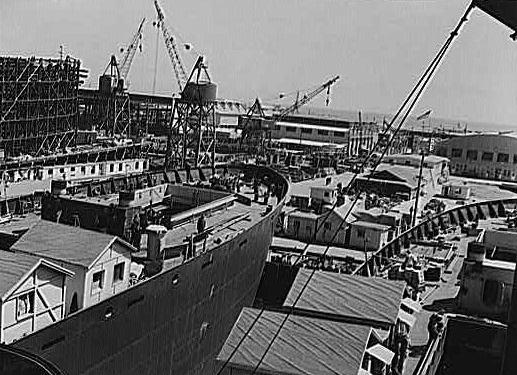 During World War II, Terminal Island continued to be an important center of shipbuilding, which in 1941 became the second largest manufacturing industry in the Southland. It was also grew in importance to the defense industry as Douglas, Lockheed, and Vulty planes were all flight tested there and equipped for war. Haskell-class attack transports were built there by California Shipbuilding Corporation, also known as Calship, and which ceased operation in 1945 — the same year the war ended. After the war Terminal Island shipyards became ship scrap yards and 55 of the 467 ships built at Calship yard were scrapped on the same site. Two of the ships built there became museum ships, the SS American Victory (moored in Tampa) and and the SS Lane Victory, moored nearer by in the East Channel. 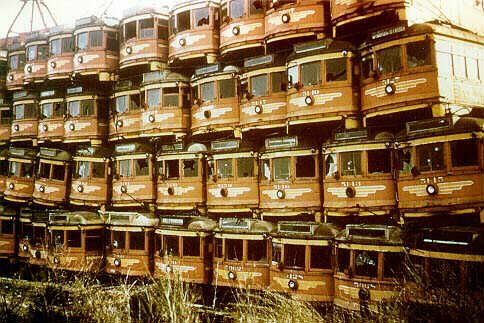 The scrap yards were later used to dismantle most of Los Angles’s Pacific Electric rail cars. 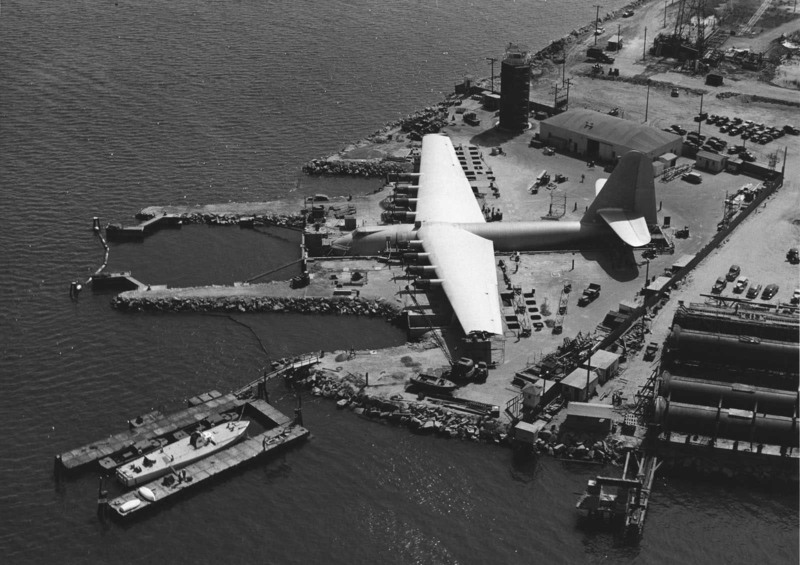 In 1946, eccentric Howard Hughes moved his massive wooden Hughes H-4 Hercules airplane — nicknamed the Spruce Goose by its detractors despite its being made mostly of birch — from Culver City to Terminal Island in preparation for its test flight. 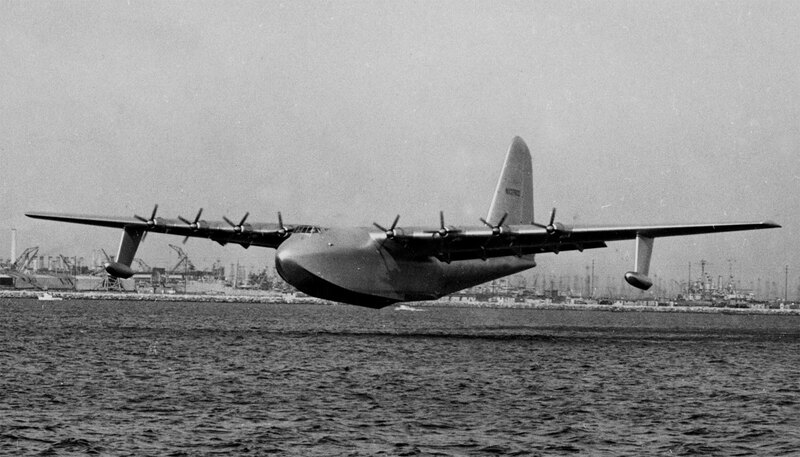 On 2 November, 1947 the Hercules took embarked on both its maiden and penultimate voyage. From 1980 until 1988 it was displayed in a large dome adjacent to the Queen Mary exhibit in Long Beach. After that it took its final trip — transported by barge, train, and truck — to McMinnville, Oregon. 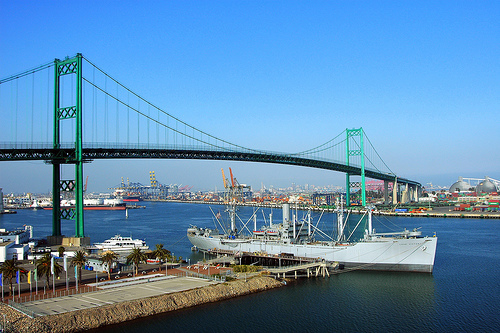 The Commodore Schuyler F. Heim Bridge (named after the man who’d been put in charge of the Terminal Island naval base in 1942) was completed in 1948. According to Bridge Hunter, the polygonal warren through truss vertical lift bridge is planned for closure. A section of the short Terminal Island Freeway, which stretches from the bridge to Willow Street in Long Beach’s Westside, nicknamed asthma alley. Even as Caltrans continues to widen freeways elsewhere (known for decades to do more likely increase traffic congestion than to relieve it) the Terminal Island Freeway looks set to be transformed into a large greenbelt/park. The Canner’s Steam Plant entered operation on 1951, providing the necessary steam for processing fish flesh for the five canneries of the Canner’s Steam Company, formed earlier in the year by French Sardine Co., Van Camp Seafood Co., California Marine Curing and Packing Co., South Coast Fisheries Inc., and Terminal Island Sea Foods, Ltd. The steam plant, designed by M. A. Nishkian, isn’t especially beautiful from the outside but is at the very least, imposing. In 1963, one of California’s most beautiful bridges opened, the 400 meter long Vincent Thomas Bridge. As a result, the municipal ferry ended service. The fact that more tourists are drawn to the 1978 Hollywood replica real estate advertisement or some run-of-the-mill mall than this beautiful suspension bridge speaks more to the misguidedness of Los Angeles’s tourist industry than it does to the intrinsic value of the city’s attractions, of which this bridge is surely one of the greatest. Whilst Hollywood hacks have relied on the lamest icons for their uninspired establishing shots, the Vincent Thomas Bridge has occasionally been utilized in films like the original Gone in 60 Seconds (and its remake), Heat, To Live and Die in L.A., Lethal Weapon 2, City of Angels, Charlie’s Angels, and National Security. In 1990, Olympic diver Larry Andreasen accidentally died trying to set a new record but most who’ve jumped from the bridge are suicides, including film director Tony Scott (The Hunger, Top Gun, The Last Boy Scout). The first building Matt and I visited was the U.S. Custom House, Terminal Island, Port of Los Angeles, Austin, Field & Fry’s New Formalist building which was originally intended to be part of a large World Trade Center complex that was never built. I thought we’d pop inside before exploring the island further and parked in an otherwise empty lot. We approached the entrance, where posted hours indicated that the building was open, only to find that the doors were locked. Moments later a police officer rolled up and we told him about the purpose of our exploration and he told us that he understood but warned us that walking in Terminal Island was bound to raise suspicions and that we shouldn’t be surprised if we had more interactions with him. After our interaction with the police officer we passed the ExxonMobil Southwestern Terminal and then the Terminal Island Treatment Plant. The air was not exactly pleasant but the functional architecture of the large anaerobic digesters is to me more impressive than most of this historic structures on the island. At the front of the plant is the environmental lab, which even has a nicely-landscaped lawn with a turtle pond. The through arch-style Gerald Desmond Bridge was designed by Moffatt & Nichol and built by Bethlehem Steel. It replaced a pontoon bridge in use since World War II. In opening scene of the film, Head, the bridge’s ribbon-cutting ceremony in 1968 is depicted as having been interrupted by The Monkees, whose members ran through the assembled and whose member Mickey Dolenz jumped off the bridge, accompanied by their recording of Gerry Goffin and Carole King’s “Porpoise Song.” The Gerald Desmond Bridge’s days are numbered as it’s going to be replaced by what will be California’s first long-span cable-stayed bridge which will allow even larger cargo ships to pass beneath it. 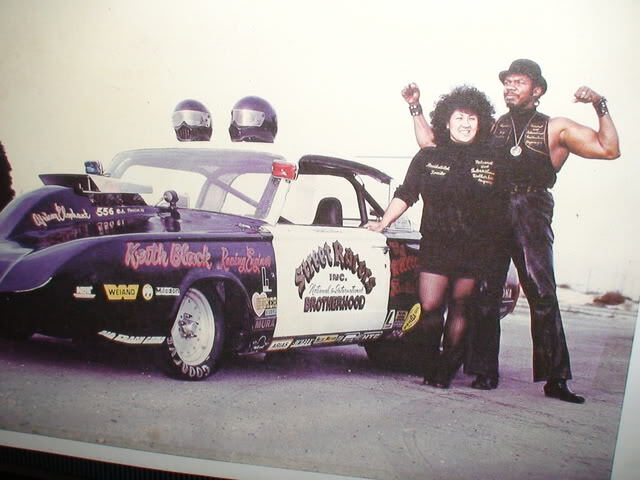 In 1974, “Big Willie” and Tomiko Robinson established the Brotherhood of Street Racers and the drag strip, Brotherhood Raceway Park, on the site of an old Navy airfield. 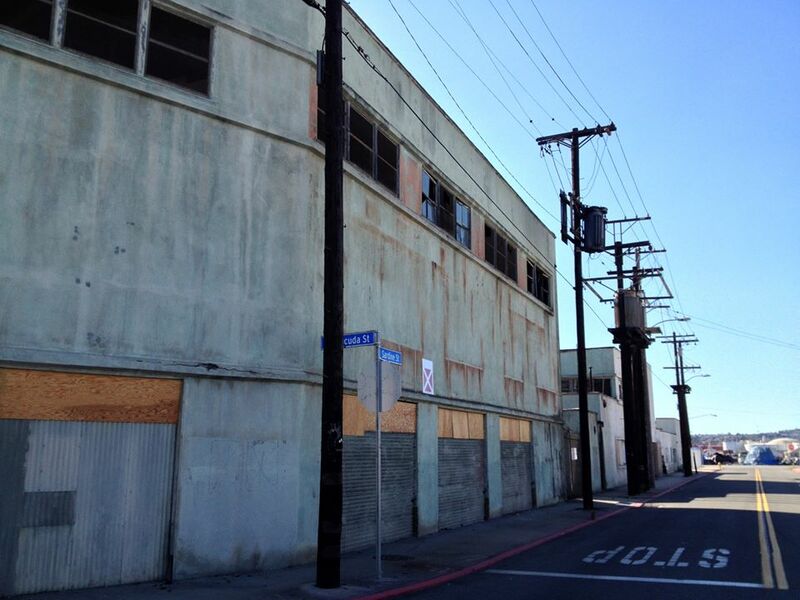 It continued to serve the youth of the Harbor and South Los Angeles until 1984. In 1993 Big Willie persuaded the Los Angeles Harbor Commission to re-open the track and it remained open until 1995, when it was shut down and displaced by a coal-handling plant. Big Willie passed away in 2012. 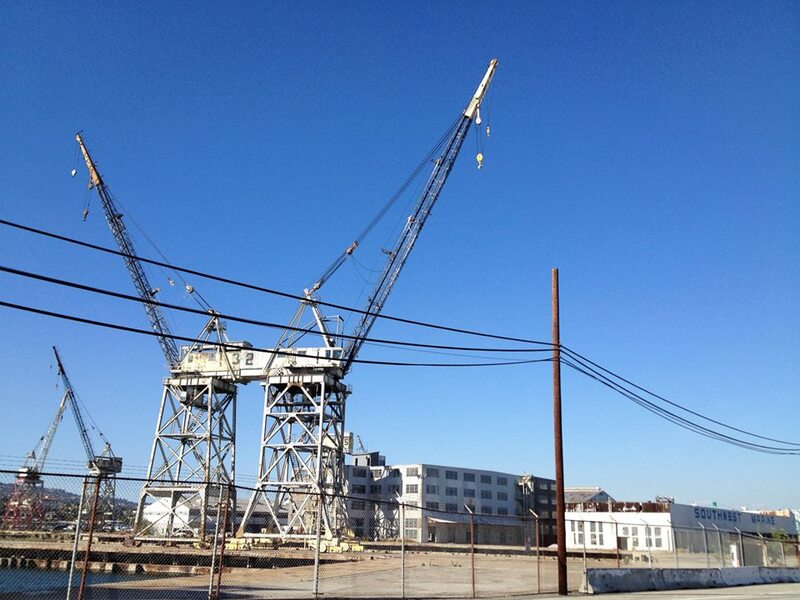 According to the 2000 census, 1,467 people listed their residence as being Terminal Island. Most of them are residents of the prison, jokingly referred to as the Terminal Island Resort (and one of several prisons nicknamed “Club Fed”), even though it was built to hold only 500. Past residents of the prison include Al Capone, Anita O’Day, Charles Manson, and Timothy Leary. Today most of the inmates are incarcerated on drug charges and the majority have never been charged with any violent crime. In our exploration we encountered a few others who seemed to live elsewhere on the island — or just off it in boats. I’m not sure when the last of Terminal Island’s residences were demolished but I did once talk to an old timer on the USS Iowa who pointed across the channel to some trees on the island and, if memory serves, said that they’d been planted on his school yard and that he’d lived over there as a child. There was an infamous dive, Joe Biff’s, which was open at least until 1980. When we visited we found two establishments that were open to the public. The first was located on the 700 block of Tuna Street, the old Japanese commercial row, and the sign above the entrance read “Harbor Light 등대Mini Mart Restaurant Fish & Chips – 7 Days.” It’s apparently been in operation at least since the 1980s but we decided to walk on. 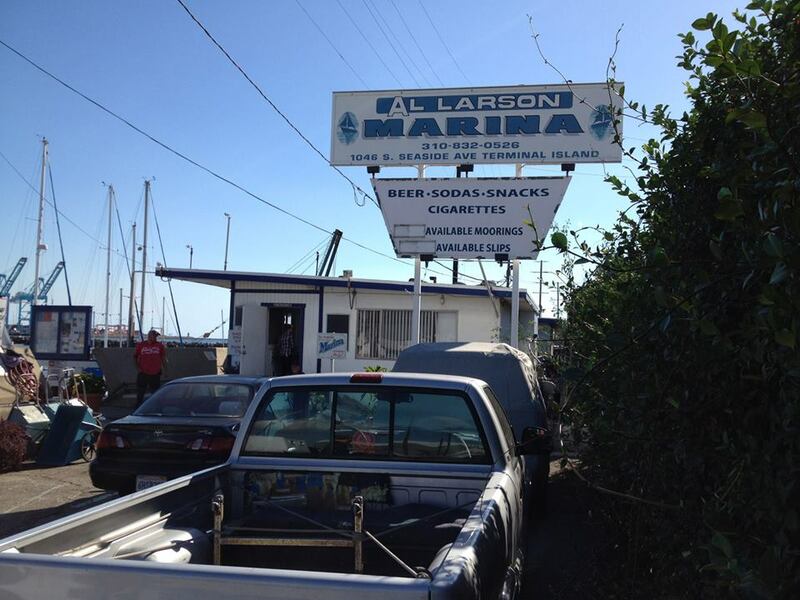 At the Al Larson Marina we found a small grill-out and cheep beverages ($1 for domestic, $1.50 tall boys, $2 imports — although a customer asked whether or not there were any happy hour specials). Matt also scored a free burger. For those interest in more history of Terminal Island, contact the San Pedro Bay Historical Society, formed in 1974, and the Historical Society of Long Beach, established in 1962. The late, great Huell Howser visited the island on episode #422 of Visiting…With Huell Howser. In the episode, titled “Cannery,” Howser visited the Tri-Union Cannery. There are also several blogs covering Terminal Island including Port of Long Beach Centennial Forum and San Pedro & Los Angeles Harbor History although neither are apparently active any longer. 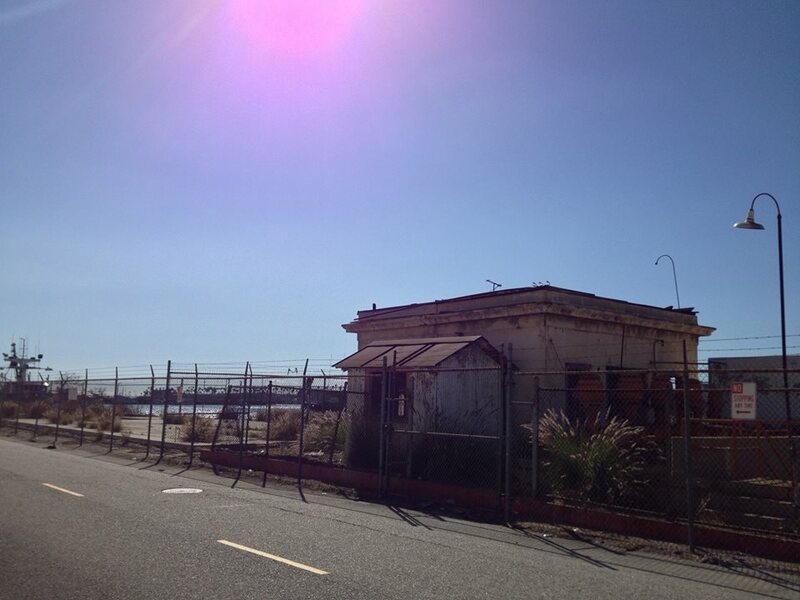 Also worth checking out is the video The Lost Village of Terminal Island. 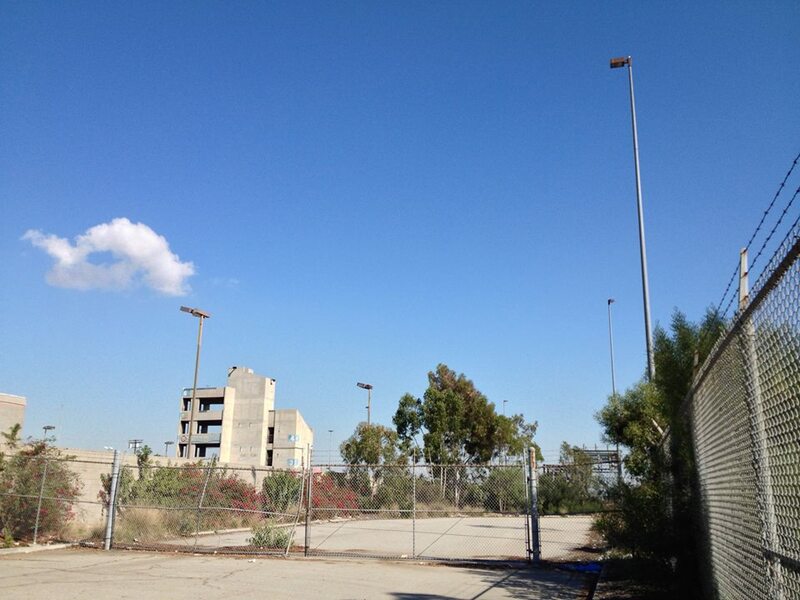 Untapped Cities has a nice piece about Terminal Island. 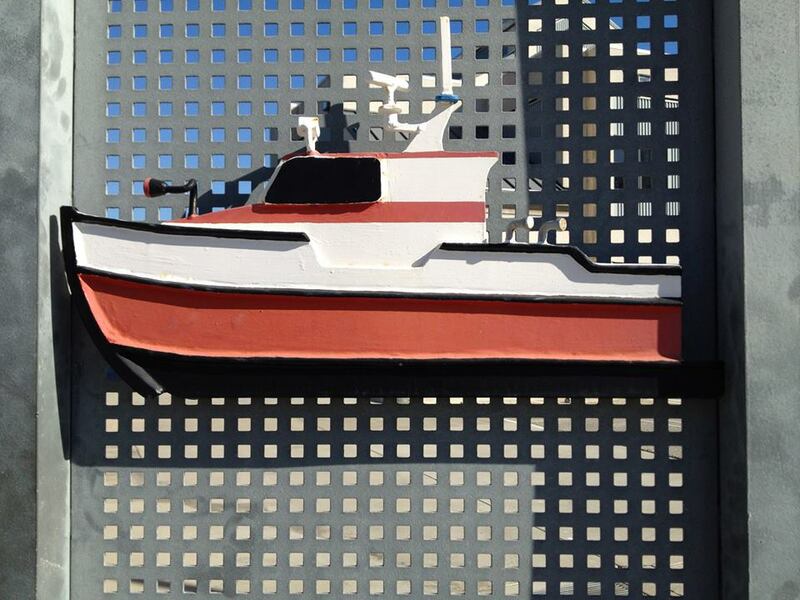 More recently, KCRW launched a series about the ports called Cargoland. UPDATE: Angel City Press just published Naomi Hirahara and Geraldine Knatz‘s Terminal Island: Lost Communities of Los Angeles Harbor, which I skimmed at the Los Angeles Festival of Books and added to my reading list! 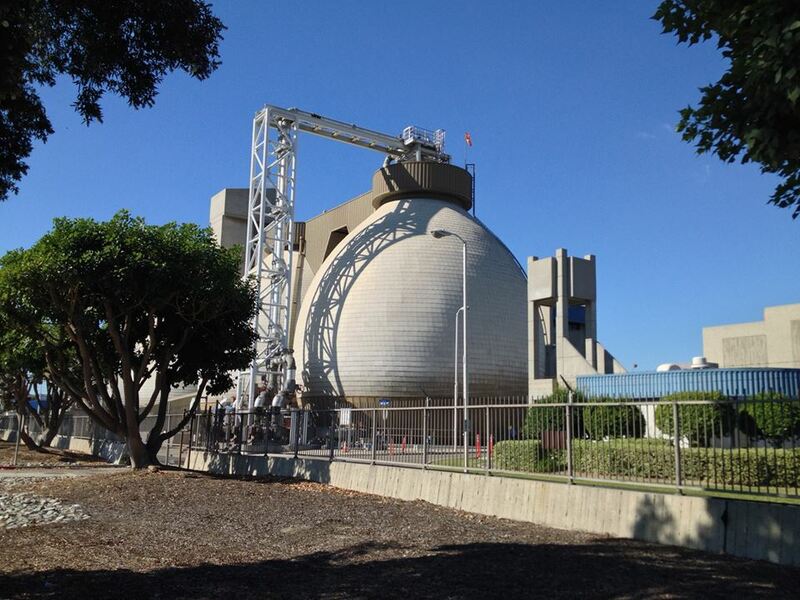 Nice article with one HUGH hole -not one word about the Coast Guard base on Terminal Island. It’s been there since before WWII and it still there today. Ah, interesting! I didn’t make it onto that part of the island because I was turned back by prison guards. When/if I return, or write about San Pedro, I’ll bring it up. 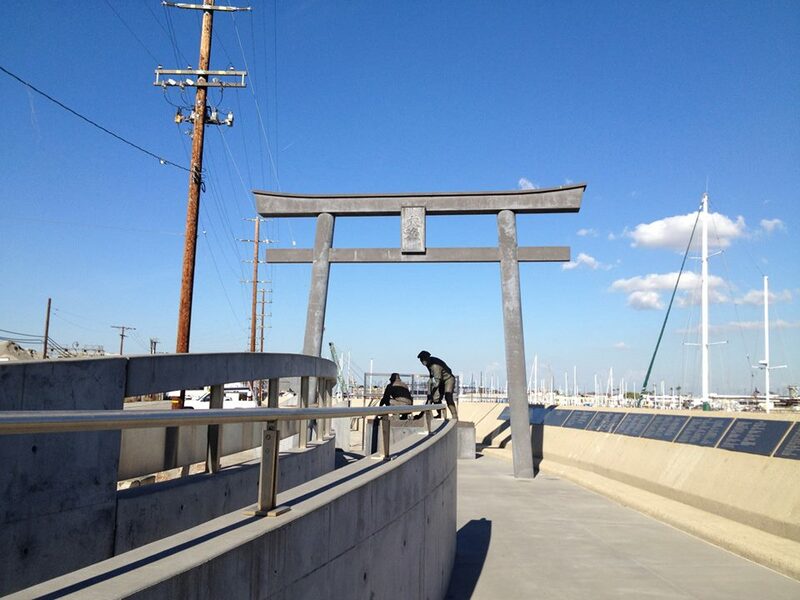 I roamed around Terminal Island yesterday after reading about the Japanese village at museums in Little Tokyo – I wish I had read this article before coming to Terminal Island! Much more extensive than anything else I’ve come across online about the island. Thank you for dredging up all the tidbits and compiling them! It was my pleasure — still one of my favorite explorations. Did you go to Harbor Light, by any chance? I was stationed in Long Beach with the USCG in the mid 1980s. 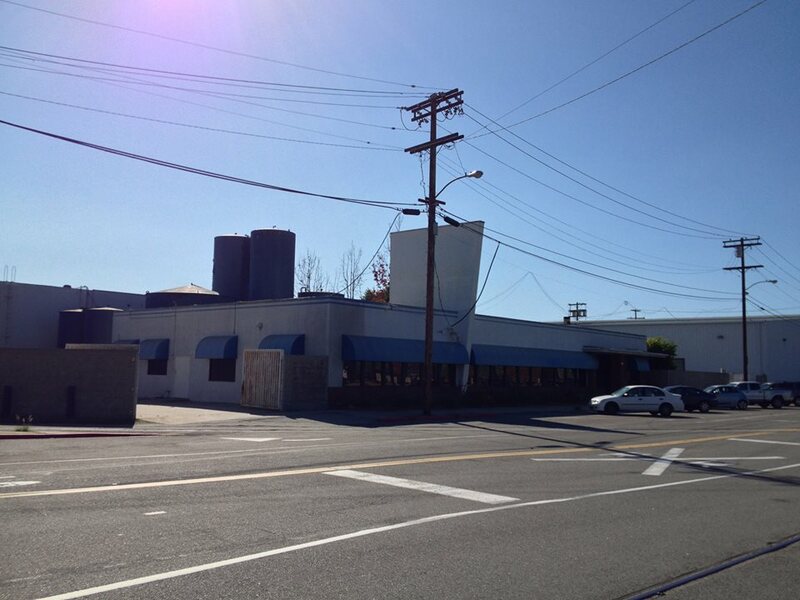 There was a wonderful prime rib restaurant on Terminal Island that I simply cannot recall the name of. I do recollect a red “band” sign on the outside of the building; inside was rustic and very western – comfortable with a great menu. Perhaps you know the name? I don’t know. However, in doing a bit of research I came across the SS Princess Louise Restaurant, which was located on a ship moored at Terminal Island from 1966-1979. I might need to add something about that to this piece. Perhaps someone else remembers the restaurant which you’re referring to. Just one of those things that keeps whirling around in my aging brain . . . I can still “see” the outside of that building with “Prime Rib” included within the red-banded signage containing the restaurant’s name. The restaurant was within a short drive from the Navy Base and was also in proximity to the Texas Lucy’s from that era. Driving me out of my feeble-mind. Thanx though for responding . . .
By by the by, some terrific snaps of the area and I have enjoyed the perusal. Tom W . . .
Joe Biff’s was the place! I still keep in touch with Owner Freddie Baum, hes doing great! Matt and Sherry, Joe Beason and Lupi, Jerry Doyle, Richard Wise, Ed and Dennise+Mark and Donell, John and Gary, Jim Green, Jay Green Buddy Green, Joey Green, and who can forget Mean old man Lyle-with the Knife in his boot.. LOL or Rocket the Viet Namm vet., Brain Miller the Dock master. then it was Darlene and Tommy, then latter Jan & Jerry who ran the store there. Eric, in case you check the comments on here…you may have hear that Elon Musk is planning on building a SpaceEx facility where the old Southwest Marine shipyard is. I was very sad to hear this news today. RIP. I had not heard but I can’t say that I’m terribly surprised. 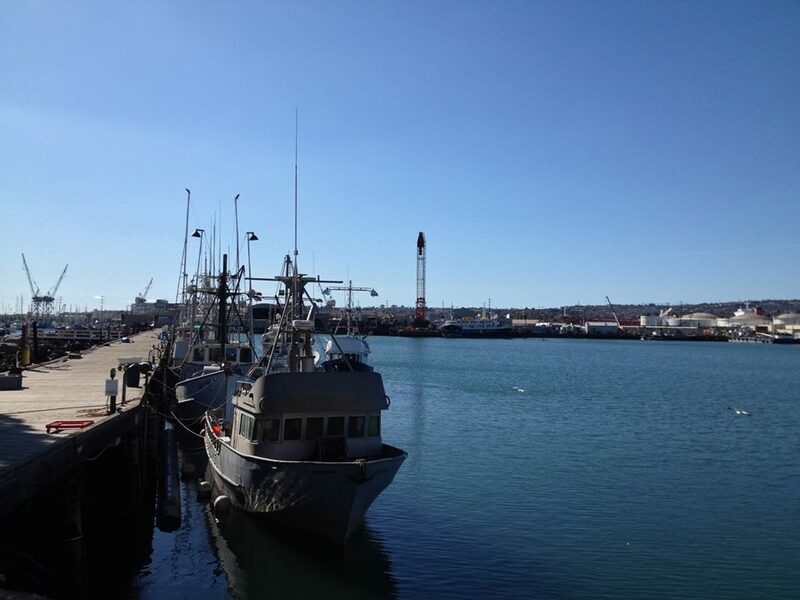 The Harbor area seems to be off the radar of the Los Angeles Preservationist crowd and there seems to be no regard for preservation by the Port of Los Angeles. I was just bemoaning the lack of protest for the destruction of the wonderful, kitschy Ports O’Call Village with a friend last night. Yeah, I knew it was only a matter of time. I have heard that they’ll be refurbishing Warehouse 1 (just across the channel from Southwest Marine) for use by AltSea, a marine research center of sorts. That sounds both promising and sad. I sort of hate seeing this gritty, off-the-grid places I love so much turning into sleek new enterprises.